In the Levant region of the Middle East, both Easter and Eid are celebrated with date-and-walnut-filled shortbread cookies called maamoul. I first learned about these delicious treats from a Palestinian coworker, who pointed out that maamoul are very similar to Russian tea cakes, one of my favorite cookies to bake. 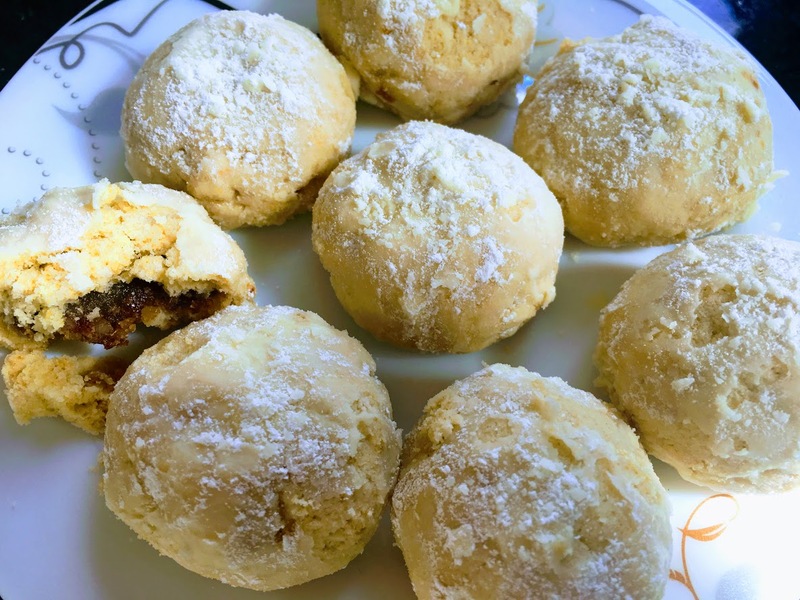 The tea cakes, which also happen to be a traditional wedding dessert in Mexico, are made with ground walnuts and rolled in powdered sugar. Nearly every region of the world, it seems, as has some variation on this cookie. Maamoul are often made with high-protein semolina flour (coarsely ground durum wheat, the kind used to make pasta), flavored with rose water or orange blossom water, and shaped using ornate molds. The recipe below is a riff on traditional maamoul, made entirely with all-purpose flour. I used a Food Network recipe as a starting point and adapted it, developing my own rose water, date, and walnut filling. After removing the cookies from the oven, I rolled them in powdered sugar as is done with Russian tea cakes. To learn more about traditional maamoul, check out this interesting NPR story. Additional powdered sugar (about 1/2 cup) for rolling cookies. Line a baking tray with parchment paper or grease with oil. Preheat oven to 325 degrees F.
Prepare the dough: Place flour, baking powder, salt, and sugar in the bowl of a food processor, and blend. Add butter, oil, and milk, and pulse until a smooth dough comes together. Remove from food processor, and set aside. If your kitchen is very warm, place the dough in the fridge. Clean the food processor bowl. Prepare the filling: Place dates, water, rose water, walnuts, cinnamon, and salt in the food processor, and pulse until finely ground. Shape the dough: Use a tablespoon to scoop out rounds of dough. Flatten each portion into a disc (roughly 1/8 inch thick) with your palms. Scoop heaping quarter teaspoons of filling onto each disc, and wrap dough around the filling until fully covered. Roll into balls and place on prepared baking tray about 1 inch apart. Steps for shaping dough, left to right: 1) place filling on dough, 2) begin folding dough around filling, 3) wrap completely so filling is no longer visible, 4) roll into a ball. Bake for 25-30 minutes, until cookies are firm. The bottom of the cookies should begin to turn golden brown, but the tops should still be fairly pale. Let cool for several minutes, and then roll in powdered sugar until fully coated. Sprinkle on a little bit of additional powdered sugar when serving. Store leftover cookies in an airtight container at room temperature.